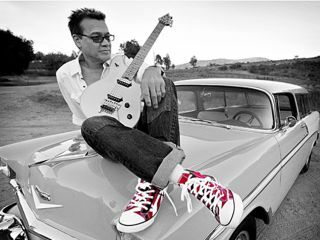 Buy Eddie Van Halen's shoes! First come the shoes, then the hammer-ons! Following in the, ahem, 'footsteps' of Carlos Santana, Eddie Van Halen has gotten in the act and is selling shoes. As opposed to ol' Devadip, however, who sells upscale ladies footwear, Eddie is hawking versions of his own homemade striped sneakers, the kind he's worn on stage for years, modeled after his famous red, white and black-striped Frankenstein guitar. "So many people would ask me, where can I get a pair of those? After hearing that for about 15 years, I figured they were something that people obviously wanted, so making them available and official seemed like a natural progression," Eddie said in an official statement. The sneaks, marketed in cojunction with FEA Merchandizing, are just the thing for the guitarist who not only wants to play like Eddie Van Halen but wants to look like him, too. In addition to the red Frankenstein theme, the shoes are also available in white with black stripes, and black with yellow stripes - all pay homage to the various guitars Van Halen has made famous on stage and on record covers over the years. The sneakers come in both high and low top versions, with the familiar '5150' tag adorning the spine.